Channeling her sound from an eclectic lineup of musical inspirations ranging from Sting to Tupac, Corina Seas hones in on her unique and otherworldly vocals. Coupled with an expertise in live instrumentation and music production, Corina’s artistry yields a unique blend of electro-pop and alt R&B. With a standout vocal styling that’s reminiscent of 90’s R&B divas and modern pop, Corina Seas’ sound is sure to capture audiences with catchy hooks, passionate lyrics, and incredible production value. A Florida native and proud Honduran-American, Corina Seas started singing almost immediately after she muttered her first few words. 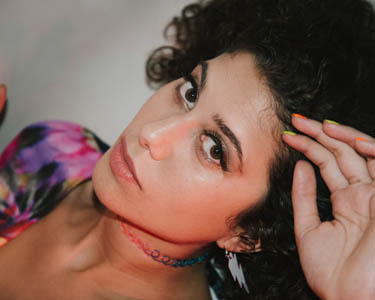 Unlike many vocalists, Corina learned to write songs first from free-write poetry, then through freestyle rap where she discovered how to transform stories into music. Now with years of musical development behind her, Corina is an expert at crafting lyrics with passionate stories and poignant messages. Despite these serious thematic explorations, she is anything but overly serious in her personal life. A self-described goofball, Corina is a fun-loving, down to earth artist with innumerable passions including dance, art, linguistics, and visual art. She is also an activist who is intimately involved with Latinas in Music and various equality and mental-health awareness groups. Corina Seas lives and breathes music. Her latest EP, Disassociated, is just a taste of what is to come. For more information visit CorinaSeas.com.